This was one of those late nights, with class ending at 9 pm on Mondays. 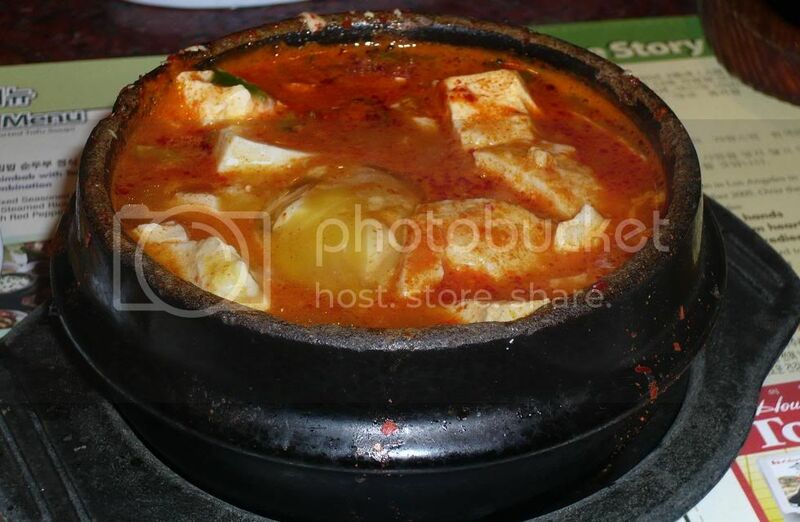 Since half of LA closes on Mondays and half closes at 10 pm, 24/7 places like BCD Tofu House are lifesavers. Although they have many branches, the Wilshire one is the most popular and I can only assume that there's a reason for it. This late at night there's usually a short wait for a table - about 10 minutes. 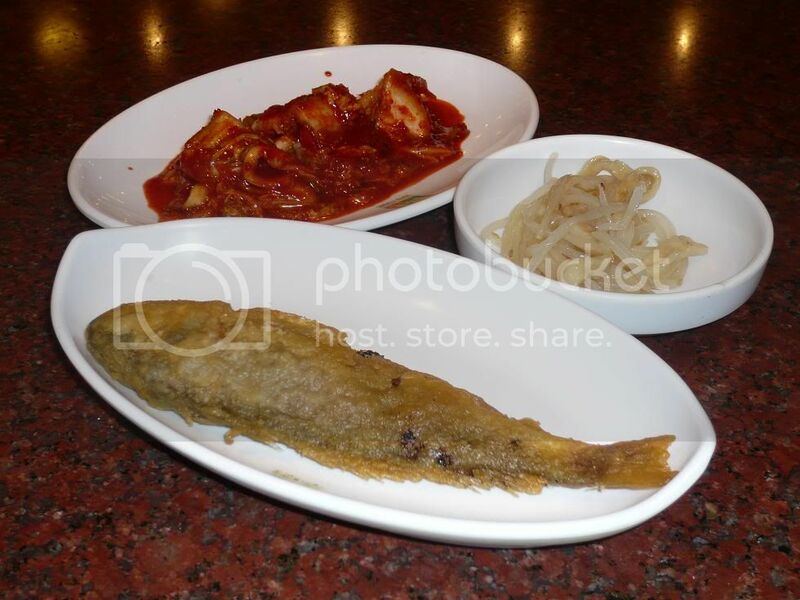 As with most Korean places, they bring out small plates of banchan. Kimchi, bean sprouts, and fish cakes are common fares, but BCS gets extra points for their fried corvina - whole small fish for each patron. In addition to soon tofu they also serve kalbi, bulgogi, bibimbap, all of which you can get as a combo with a smaller portion of soon tofu. I got the beef soon tofu- mild, of course, since I can't eat spicy. Not really comparable to Beverly tofu, for one. The one here is rather ... bland, in comparison. They also give less tofu and meat, and of lower quality. But it's not bad. It's still comforting and filling. At 10 o'clock at night, it's very satisfying. I used to love BCD but not that I've gotten spoiled by Beverly it's harder to come back here unless the other one is already closed. 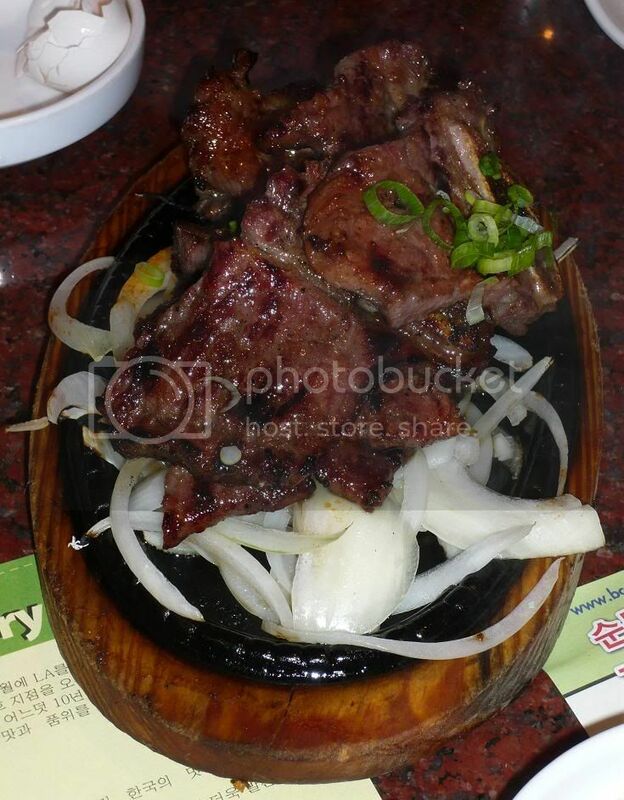 The kalbi is tender and flavorful. The meat is sometimes a bit fatty, but overall a tasty dish. 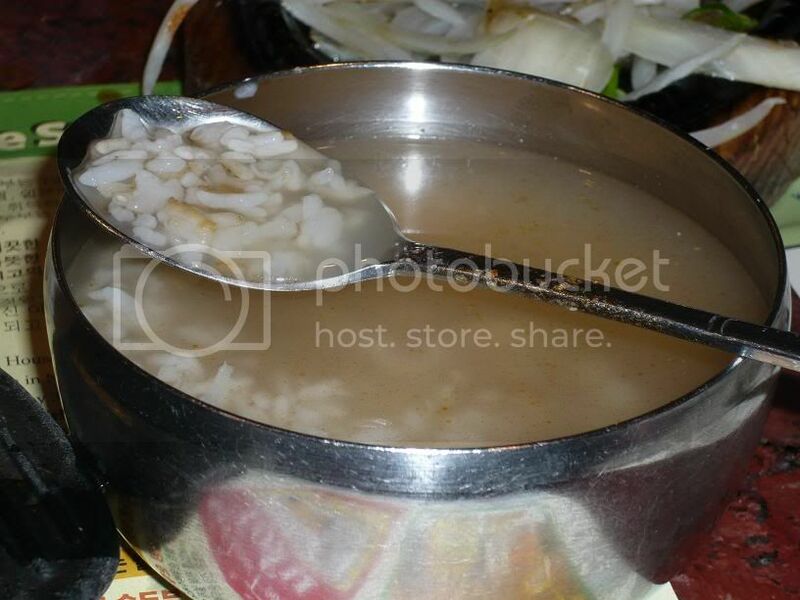 Another thing that BCD Tofu gains extra points at is this: Their rice is served in a stone pot, and then they scoop out the slightly burnt rice from the edges and serve it with water. This make a nice, soothing rice 'soup' that is just soo right after all that spiciness from the soon tofu. Much better than del taco.. I'd rather go hungry than eat late night tofu, or midday tofu for that matter. At least they have other options. Yeah they have bibimbap kalbi etc, but what's wrong with Tofu, Josh? I love BCD Tofu. I frequent the one downtown. I love usually get the combination soup. I will definitely check out Beverly. Thanks! I've been there a few times but really don't remember what it tastes like...because I've never been there sober.